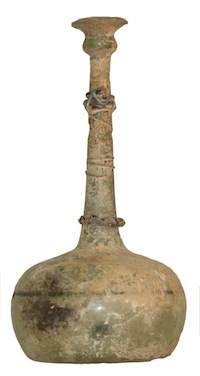 description: Tall, thin-necked bottle with a tulip-shaped mouth. There is an approximate 5 mm interior flange running through the mid-point of the bulbous body and three bands of applied decoration to the neck: the lower band a thick, pinched dark blue; the mid-point in a three twist trailed decoration in the same colour as the body; the upper in dark blue trail with a cage in turquoise blue applied over. Greenish glass, dark blue and turquoise appliqués as noted. Small hole to the body repaired, spreading fractures from the hole are stable, trace encrustation, old collection label to the base.